Fourrée Drachm (2.87 g, 13mm, 7). SNG München -; SNG Alpha Bank 185. Notes: Drachms of Pausanias are extremely rare, with only five known to Wesermark in public collections (BM, Glasgow, and Athens), and four in CoinArchives. Westermark (p. 306) notes that the vast majority of Pausanias' silver coins are plated, reflecting a possible shortage of silver during his reign. AR Drachm (3.42 g, 16mm, 4). Thunderbolt below, ΔΗ in exergue. Ref: Le Rider pl. 23, 22; SNG ANS 461; SNG Alpha Bank 282 var. (control mark); Winterthur 1463 (same rev. die). Pedig: Ex Münzen & Medallien GmbH 10 (22 Mar 2002), lot 176. Notes: According to LeRider, this mint/control mark denotes the first issue of Philip's coinage minted at Amphipolis (issue IA). 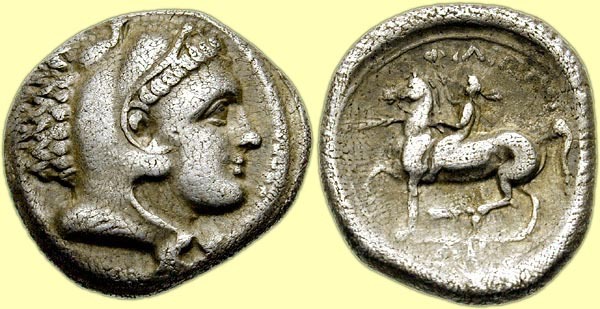 M. Price's rearrangement of LeRider's mint scheme would place this coin in the first issue of the mint of Pella in 348 BC (see previous lot for discussion). Other published specimens: SNG Copenhagen 567-8 var. (control marks); SNG Berry 123 var. (same); Pozzi 1652 var. (same); Winterthur 1463 (same reverse die). AR Drachm (4.29 g, 17mm, 9). Mint: Primary Macedonian mint ('Amphipolis'). Struck: Under Antipater, circa 325-323 BC. Zeus Aëtophoros seated left; in left field, o within Π.
Ref: Price 141; Troxell, Studies, group E/F. Notes: This drachm type was unknown until the discovery of one piece the 1919 Sinan Pascha hoard (published by M. Thompson in ADM I), which was acquired by E.T. Newell, and is now in the ANS (1944.100.28940; along with 1944.100.28941, another example that Newell had subsequently acquired). No pieces were found in the large 1964 Asia Minor hoard, but six were found in the 1993 Near East hoard (published by C.A. Hersh & H.A. Troxell in AJN 5-6 ; one of these is likely BM 2002,0101.83, which was part of Hersh's bequest). The chronology of the Sinan Pascha hoard allowed Thompson, followed by Price, to place this drachm issue among the huge tetradrachm issues with the same control (always paired with another symbol; Price 128-40), dated to circa 320-317 BC. However, the inclusion of the type in the Near East hoard, certainly deposited by 322 BC, disproved such a late placement as Hersh & Troxell noted (but they did not give a new date range). 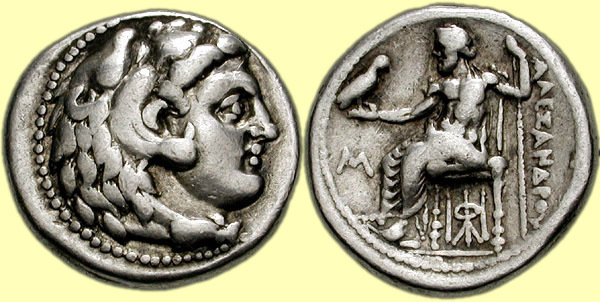 In her seminal work on the primary Macedonian mint, Troxell firmly placed the issue parallel with her tetradrachm groups E and F, in the period circa 325-323 BC. By the time of her writing, she had located three additional two examples (one of which must be ANS 1990.16.1), bringing the total known to ten. The coin ANS 2002.11.226 may have been the other new piece known to Troxell, but it may have also been one of the 1993 hoard coins. As all of these 1993 coins were dispersed in the marketplace, it is uncertain whether the present coin is a new example, or another from the Near East hoard. Only one has been in commerce, part of lot 176 in CNG 58 (2001). Interestingly, an apparent hoard of Alexander drachms on the market since 2017, which has a nearly identical composition as the 1993 hoard, did not contain any of these, though contemporary Amphipolis drachms were part of the hoard..
AR Drachm (4.27 g, 15mm, 3). Struck: Under Kalas or Demarchos, circa 328/5-323 BC. Pedig: Ex Classical Numismatic Group 81/1 (20 May 2009), lot 332. Notes: This coin is from the earliest issue of Alexandrine coinage at Lampsakos, which was comprised of both Tetradrachms and drachms. All of these coins have the caduceus symbol, and some have the additional monogram below the throne, as here. Although Price and ADM list the drachm denomination as only having the caduceus, this coin proves this to be incorrect. Both Price and ADM cite the ANS specimen (from the Sinan Pasha hoard), on which on the caduceus is visible. However, the present coin, struck from the same dies, proves that the ANS coin must also have this monogram, but that it is off the flan. Thus, this drachm issue corresponds to the tetradrachms of Price 1344, rather than Price 1342. This particular drachm issue is very rare, with the ANS/Sinan Pasha coin being the only published example (none were found in the 1993 Near East hoard, nor the 1964 Asia Minor hoard). The study of the 1993 Near East hoard by H.A. Troxell and C.A. Hersh (AJN 5-6 ), provides the most recent analysis of the chronology of the emissions of the Alexander drachm mints. While many of the early emissions have been downdated at most mints, the evidence is inconclusive for the earliest issues at Lampsakos and Sardes. Circumstantial evidence suggests they were very limited issues, and may have begun as early as 330 BC. G. Le Rider, however, in an article affirming the findings of Troxell and Hersh ("Alexander in Asia Minor" in Essays Hersh), goes further, and provides an argument that none of the western Asia Minor mints began striking Alexander type coinage, in any denomination, until 325 BC. Regarding the issuing authority, Thompson (ADM) and Price are unclear, but it must have been Antigonos I Monophthalmos. In 333 BC, Alexander gave him the satrapy of Hellespontine Phrygia, then Lycia and Pamphylia in 331 BC, effectively making Antigonos the Macedonian overlord of Western Asia Minor. It is interesting that the monogram on this, the earliest Alexandrine coinage at Lampsakos, may resolve as AN, which may refer to Antigonos. AR Drachm (4.25 g, 15.5mm, 12). Notes: This issue, with a K below the throne as a subsidiary symbol to the primary club symbol, was unknown before the discovery of the 1993 hoard of Alexander drachms, reported by H. A. Hersh and H. Troxell in AJN 5-6 (1993/4). The hoard contained three examples, which was die linked to the main Series II issue, Price 1347, by at least one of the coins. The present coin, likely the fourth known, is exceptional in that it is the only coin of Series II that is obverse die linked to the very rare drachm issue of Series I at Lamsakos, verifying Margaret Thompson's arrangement of the club series as the second series at Lampsakos. One may also observe that the obverse die here is slightly more worn than when it was used to strike the Series I drachms. This die link also suggests that this issue with the K may be the earliest issue of Series II. AR Drachm (4.28 g, 17mm, 8). Struck: Under Kalas or Demarchos, circa 325-323 BC. Ref: Price 1499 corr. and 1502; ADM II Series I, 20 (same obv. die). Pedig: Ex Classical Numismatic Group 93 (22 May 2013), lot 145. Notes: This drachm is from the first issue of Alexander type coinage at the mint of Abydos, which was composed of staters, tetradrachms, and drachms. All coins of this issue have the same control marks, Hermes and a Ξ (sometimes engraved in a horizontal orientation). Although Price 1496-1501 list a type with "male left, wearing chlamys" ADM clearly shows that this is erroneous. The coins Price reference simply were struck such that the full figure is not visible. As such, the following entries in Price are redundant: 1499 and 1502, and 1501 and 1503. Furthermore, it is likely that Price 1496 and 1497 are the same type, with the coins of Price 1496 likewise struck off center such that the Ξ is not visible. Of note about this particular coin, the engraver of the dies of this drachm was likely also the engraver of one of the tetradrachm dies: ADM 7. AR Drachm (4.26 g, 16mm, 12). Struck: Under Menander, circa 330/25-324/3 BC. Ref: Price 2536; ADM I 25; SNG Saroglos 787. Pedig: Ex G. Hirsch 260 (12 February 2009), lot 1622. Notes: This coin is from the earliest issue of Alexandrine silver at Sardes, which was comprised of only drachms. Sardes was among the earliest mints in Asia Minor, and was the royal mint for the Persians, striking darics and sigloi down to the time of Alexander's conquest. Newell, Thompson, and Price all assert that Sardes must have been employed by Alexander almost immediately after capturing the mint. The first three issues were comprised exclusively of staters, and were issued in substantial quantities. The fourth issue was apparently significant, as it was not only composed of staters, but also halves and quarters, as well as these drachms. Although the mint became one of the drachm mints for Alexandrine coins, staters also continued to be issued in large numbers, attesting to the importance of the mint. This particular drachm issue is very rare, with only about seven known prior to the present coin (the first is in the Saroglos collection, another was in the 1964 Asia Minor hoard [currently in the Hersh collection], and five were found in the 1993 Near East hoard). The study of the 1993 Near East hoard by H.A. Troxell and C.A. Hersh (AJN 5-6 ), provides the most recent analysis of the chronology of the emissions of the Alexander drachm mints. While many of the early emissions have been downdated at most mints, the evidence is inconclusive for the earliest issues at Lampsakos and Sardes. Circumstantial evidence suggests they were very limited issues, and may have begun as early as 330 BC. G. Le Rider, however, in an article affirming the findings of Troxell and Hersh ("Alexander in Asia Minor" in Essays Hersh), goes further, and provides an argument that none of the western Asia Minor mints began striking Alexander type coinage, in any denomination, until 325 BC. Regarding the issuing authority, Thompson (ADM) and Price are unclear, but it must have been Antigonos I Monophthalmos. In 333 BC, Alexander gave him the satrapy of Hellespontine Phrygia, then Lycia and Pamphylia in 331 BC, effectively making Antigonos the Macedonian overlord of Western Asia Minor. AR Drachm (4.16 g, 16mm, 12). Struck: Under Menes, circa 325/4-324/3 BC. Zeus Aëtophoros seated left; AP monogram in left field. Ref: Cf. Price 3424 (tetradrachm). Pedig: Ex London Ancient Coins 12 (7 June 2012), lot 76. Notes: This coin is the only known drachm for the large issue of tetradrachms listed as Price 3424, for which a handful of obols have also recently come to light. (Note: Price 3426 appears to be the same as Price 3424, but the difference is the style, most recognized by the position of the legs of Zeus, with the latter issue having parallel legs while the former has crossed legs.) The conventional attribution of this issue to Byblos was based on Newell's analysis of the Demanhur hoard, but Price thought that this mint assignment was highly doubtful. In his recent study of the Alexander coinage, Le Rider also was of the opinion that Byblos was incorrect. In the Helllenistic period, this particular monogram was the canonical civic monogram of Arados. Although most of the early Aradian Alexanders with a civic monogram had a different form, with the P in small form below the A, this fact is not dispositive of these also being assigned to that mint. In addition to the monogram, the overall style strongly suggests an attribution to Arados. In particular, the lion's mane and the hair of Herakles on the obverse, and the drapery on the legs of Zeus on the reverse are identical to the early issues of both Tarsos and Myriandros (or Issos), which are securely dated to Alexander's lifetime. Except for Tyre, all of the Phoenician cities peacefully capitulated to Alexander, and were therefore given very favorable treatment. It is likely, as at Tarsos, that the production of Alexanders at these long-operating mints began shortly after their conquest. Arados is the northernmost mint in Phoenicia, and is the closest mint to both Tarsos and Myriandros/Issos to strike Alexanders, which would explain the strong stylistic similarity of these Alexanders to the Alexanders from those mints. AR Drachm (4.15 g, 16mm, 8). Struck: Under Menes. Dated RY 7 of Abdalonymos (327/6 BC). Ref: Cf. Price 3483 (tetradrachm); cf. Newell, Sidon 22 (tetradrachm). Notes: This is the earliest known dated Alexander-type drachm from a Phoenician mint. At Sidon, previously the only known issue of drachms was Price 3488, from year 9. This is one of only two known drachms from year 7 (the other is in a private collection), which is the first year of the dated coinage at Sidon. AR Drachm (4.30 g, 14.5mm, 6). 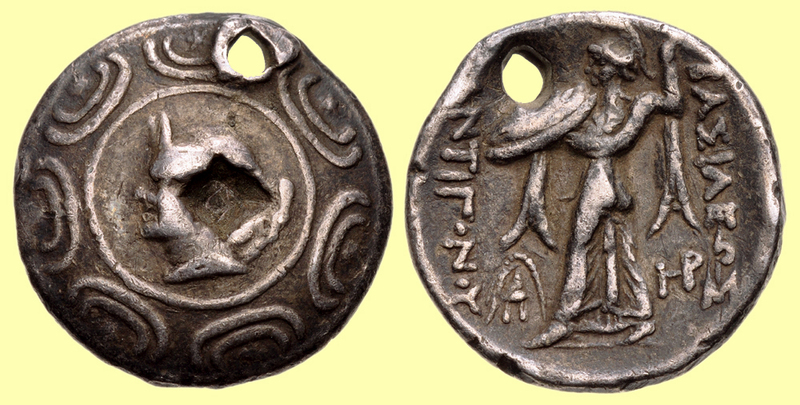 Struck: Under Menon or Menes, circa 332/1-328/7 BC. Zeus Aëtophoros seated left; no control marks. Ref: Price 3245 (Ake); Newell, Dated 7 (Ake). Notes: For the reattribution of the Alexander series of Ake to the mint of Tyre, see A. Lemaire, “Le monnayage de Tyr et celui dit d’Akko dans la deuxième moitié du IV siècle avant J.-C.,” RN 1976, and G. Le Rider, Alexander the Great: Coinage, Finances, and Policy (Philadelphia: American Philosophical Society, 2007), pp. 125-34. This coin is from the very rare first issue of drachms at the mint of Tyre. Although Newell (and Price) do not explain the placement of these drachms in the series, it certainly must have been based on style. An examination of the published drachms of this issue shows that the style of the obverse and reverse dies that were used are identical to that found on tetradrachms of Newell's Period II, where he places this issue. AR Drachm (4.28 g, 16mm, 12). Struck: Under Stamenes or Archon, circa 325/4 BC. Ref: Price 3580; Waggoner dies 13/— (unlisted rev. die). Notes: This coin is from the sole drachm issue from the first series of Alexander coinage at Babylon, and may be only the second example known. Waggoner records a single specimen, in the Turin museum. There are no examples in the Pella database, nor CoinArchives (other than the present coin). Only the Turin piece is in the ANS Photofile. Price dated the coinage to 331-325 BC, but Le Rider has more convincingly argued that the coinage at Babylon likely did not begin until 325/4 BC..
AR Drachm (4.23 g, 16mm, 8). Struck: Under Stamenes or Archon, circa 324/3 BC. Ref: Price 3604; Seleucus I Hoard 1294 (this coin). Notes: Lifetime issue, struck at Babylon, during the time Alexander was there (and died). According to Price's introduction to the 'Babylon' mint, it is possible that the large "second group" (or series), to which this coin belongs, may have been struck at the mint in Susa, rather than Babylon (based on stylistic and logistical considerations). Also notible is that while the tetradrachm issues of this series are numerous, there are only two issue of drachms.. Struck: Struck under Koinos, circa 324/3-323 BC. Ref: Price 3830A var. (control marks). Notes: Susa, a major Persian city and imperial residence, was captured by Alexander in December, 331 BC. The easternmost of Alexander's mints, coinage apparently began there shortly before Alexander's death. However, no detailed study has been done of the pre-Seleukid coinage of Susa, and the attribution of its earliest issues is tentative. Except for the drachms Price 3830A and the present coin, as well as the obol Price 3834, all of the recorded issues have the royal title, which suggests they were struck no earlier than 324 BC, when it is thought to have been introduced. As later issues at Susa also include a handful of varieties without the title, the absence of the title on some may not be relevant for determining their chronology relative to the other early Susa issues. AR Drachm (4.05 g, 16mm, 7). In the name of Alexander III. Struck: Under Antipater, circa 320-319 BC. Zeus Aëtophoros seated left; monogram in left field. Pedig: Ex VAuctions 214 (16 October 2008), lot 4. Notes: Troxell notes that she knew of no small denominations of Alexander type following her Group F, circa 323/2 BC. This coin, though, is the drachm denomination corresponding to the tetradrachms of her Group I3, which she dates circa 320/19 BC. 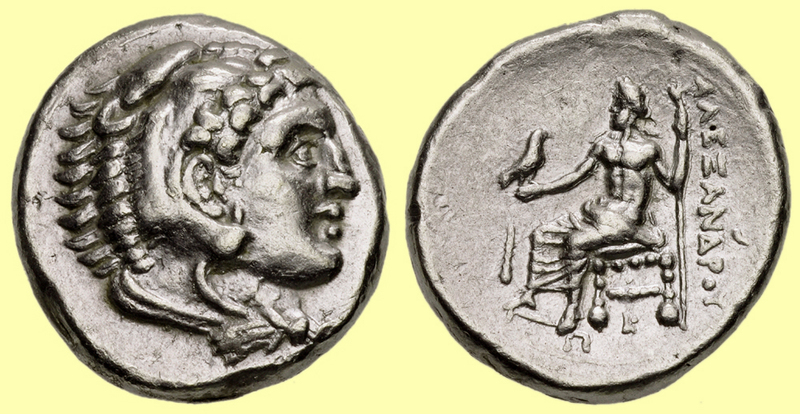 Only the Zhuyuetang and the present coin are known for this issue, and no drachms or other silver fractions have been identified for any other of the post-Group F period of Alexander coinage at the primary Macedonian mint. Troxell's dates for Group I comport with the period just following the conclusion of the First Diadoch War, when huge numbers of troops would have been returning to Macedon after the peace of Triparadisos. As with the Alexander drachms of the Asia Minor mints during this time, it is possible that these drachm were part of a payment to troops redeploying from the East..
AR Drachm (3.61 g, 15mm, 10). In the name of Alexander III. Mint: Uncertain mint in Cilicia. Struck: Under Philoxenos, circa 320-318/7 BC. Zeus Aëtophoros seated left; ΦΙ in left field, ΛΣ below throne. MN 26 (1981), pl. ix, G (same dies). Pedig: Ex Roma E-16 (28 February 2015), lot 85. AR Drachm (4.27 g, 17mm, 11). In the name of Alexander III. Struck: Under Antigonos I Monophthalmos, circa 320-317/6 BC. MN 26 (1981), 16a = ANS 1952.123.185 (same obv. die). AR Drachm (4.30 g, 16mm, 1). Zeus Aëtophoros seated left; Δ in left field, ΖΩ below throne. Notes: As with most of the eastern Alexandrine mints, there has been little study of the pre-Seleukid issues at Ekbatana. Unlike the other mints, though, only three issues are possible for this period at Ekbatana: Price 3956, P221, and P222. The hoard context of these coins make their placement at an eastern mint certain, and their style are a close match with the earliest Seleukid pieces placed at Ekbatana. Price sees a connection of the Zo- of these issues and the Zod- of the early Seleukid issues, but this is speculative. Interestingly, though Alexander placed his treasury at Ekbatana, no coins are known to even possibly belong there during his lifetime. Therefore, if the placement of these Zo- issues are confirmed to belong at Ekbatana, they would be the earliest Alexandrine coinage there. AR Drachm (4.06 g, 17mm, 2). the center of a Macedonian shield. left, HP monogram to inner right. 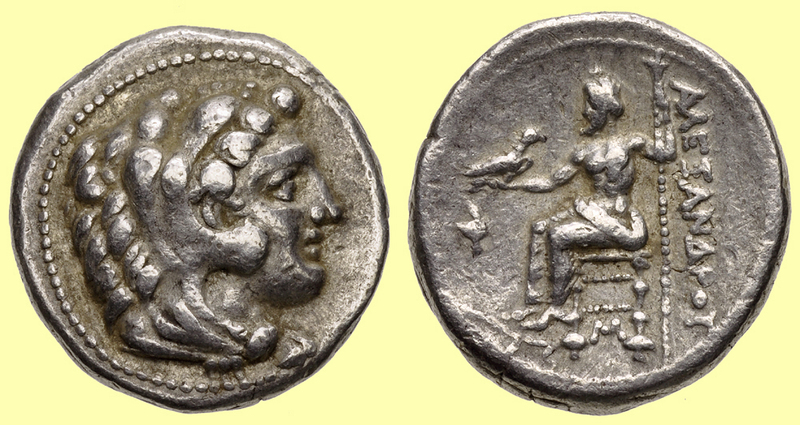 Notes: Although the Gonatas' Pan-Athena tetradrachms are quite common, this is only the second known example of a drachm. The BM specimen has been in their collection since 1888, but had not been published until appearing recently on their website.